Are you looking for a 40 inch LED TV for home or office? You are at the right place. 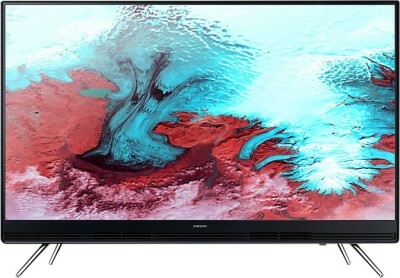 We have come up with a list of top 10 best 40 inch LED TVs available in India as of April 2019. We have covered both Smart and Non-smart 39 and 40 inch LED TVs from top brands like Sony, Samsung, VU, Kodak, Micromax. All LED TVs on the list come with Full HD resolution display. The price of LED TVs on this list is from Rs. 20000 to Rs. 45000 so if you are looking for a LED TV under 20000, 25000, 30000 or 40000, you will be able to find it here. We have included some Smart TVs as well on this list. All these LED TVs have high-quality display panels which provide rich lifelike colors. On the audio side, you will see dual speakers delivering sound output between 20 and 40 watts. These days companies like VU, Kodak are making quality products at low prices. We like VU LED TVs because they offer high value for money. So if you need a nice LED TV but don't want to spend too much then go for VU 40 inch Smart LED on this list. If you like big brands and can spend more then you have options like the Sony 40 inch Smart LED TV which will cost you around 40000 Rs. Let's take a look at best 40 inch LED TVs in India. Below you will find a brief review of every television with its specs and pros cons. This is a latest 2019 series 40-inch smart television from VU which comes with a Full HD resolution and an A+ grade panel. Given to all the specification, the display quality is really good with perfect brightness for a television costing less than 20k and with its 40-inch design, it is suitable for a medium-sized room. It is a Smart TV supports multiple entertainment content providers like Netflix, YouTube, Amazon Prime with dedicated buttons for them on the remote to open the corresponding app quickly. The other top content providers like Hungama, Eros Now are also supported by VU. You can also cast your phone screen to view any other content over the internet. Along with WiFi, this TV allows for ethernet connectivity to use it as a smart TV. VU calls this TV as Ultra Smart TV for the reason it provides a display with good brightness level as well as powerful sound output. For an overall great experience, VU has provided DTS sound technology into the speakers that have a powerful 20 W output and the sound is loud enough for a medium-sized room. For external connectivity, VU has added 3 HDMI and 2 USB ports on the side and back on the TV. If you are looking for a 40-inch smart tv under 20000 then this is the best you can get from VU. 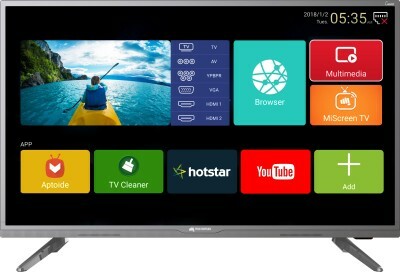 This is a 40 inch smart TV from MarQ, a Flipkart brand in electronic appliances. There is a lot to like and check in this led tv and comes at a very attracting price of under 20000. The 40-inch display has a Full HD resolution (1920 * 1080) with bright and crisp colours and perfect contrast. The screen is an A+ type having true colour feature for a good level of clarity and minimum blurring. There are particularly thin bezels all around the television and also has a sleek profile to make it look attracting in terms of design. This smart tv has inbuilt WiFi and comes with a Netrange app store that allows you to download and use social media, entertainment, messaging, gaming apps and much more. To make your life easier to launch and view movies and videos of YoutTube and Netflix, MarQ has provided dedicated hotkeys on the remote to quickly launch any of two apps. Also, as a common feature, this smart tv also allows you to cast your mobile screen on the TV to view any photos, video stored on the phone. But what differs here in the number of HDMI and USB ports offered, here you get 3 HDMI and 2 USB ports where the other LED TV offer 2 HDMI and 1 USB ports. 1 HDMI would be permanently used your set-top box and other can be used to connect external peripherals. Audio Quality matters a lot in the experience of a LED TV and here you get Dolby digital speakers with powerful 20 W output and the volume is sufficiently loud with no shivering experienced even at the high volume level. Overall, at the cost of 20k, you get a bright Full HD resolution 40-inch display with good features and powerful specification. MarQ has service centres in around 300 cities. This is a 40 inch Full HD Smart LED TV from TCL available under 20000. TCL has made a decent brand name in the Indian market given the price they offer and which is also evident from great user reviews they have been getting. With the Full HD resolution, the colour reproduction is good with a bright and crisp display. It also uses noise reduction technology that further enhances the image quality. On the sound quality, you get a 10 W speaker output which is decent from a 40 inch LED TV and for the medium-sized room, it is ideal for. With the amplified audio, you get depth in the sound with proper loudness. You can switch between different sound effects for sports, movies etc with inbuilt equalizers. With this TCL LED TV, you get 3 HDMI and 2 USB ports and this is a Smart TV so you can connect it to your smartphone and mirror content. Streaming movies and videos via the internet is also a breeze. In this LED TV, at a price of under 20000 to 25000 Rs., you get a nice Full HD display, decent sound output, smart tv functionality. It is a good value for money with 3 years of warranty. Samsung is one of the top electronics brands in India. Samsung is known for their quality products and same is the case with this 40 inches LED TV. It offers great picture quality with decent viewing angles. The sound is loud and clear. The Samsung LED TV uses Wide Colour Enhancer technology in order to improve image quality. This technology takes advantage of advanced algorithms to deliver better colors. The LED TV has 2 HDMI ports and 2 USB ports to connect it to external media devices like USB drives, set-top boxes, laptops etc. The TV comes with a 1-year warranty. Samsung's after sales network is one of the best so you don't have to worry about anything is something goes wrong with the tv. The LED TV is slightly overpriced if you compare it with other brands like VU, Kodak etc but that's what you have to pay for superior quality and service. Panasonic is a well-known electronics brand across the world. Their products have great quality and compete with brands like Samsung and LG. This is a value for money LED TV from Panasonic. Price is decent for a LED TV of 40-inch size. The build quality of the LED TV is great. Pictures are vibrant and have good viewing angles. The sound output is also decent. There are no major negatives with this TV. It is not a smart TV so if you want to stream content from the internet then buy a chromecast or Fire TV to make this LED a Smart LED TV. Go for it if you are looking for a big brand 40 inches LED tv under 30000. Kodak is a new brand in LED TVs but they are doing very well. This 40 inch Smart LED TV is a great value for money. Normally Smart LED TV of this size cost above 30000 but here the price is around 20000 only. The LED TV comes with a large 40-inch display of Full HD 1920x1080p resolution. With the great resolution, you get great picture quality which detailed pictures and good saturation and contrast as well. The wide-viewing-angle feature ensures that you can enjoy the on-screen action from an angle of up to 178 degrees. The display also has Kodak’s Dynamic Picture Enhancement technology with which the blacks will be darker and the whites will be brighter, giving you a balanced contrast and brightness ratio. Plenty of USB and HDMI ports are available to connect the LED tv with external devices. Plus, it is Smart TV so you have the options to connect it to WIFI and watch movies directly from the Internet. You can also mirror your smartphone screen on to the LED using Miracast. Dual speakers on this LED deliver 20W output and provide an immersive viewing experience. It is clearly one of the best 40 inches Smart LED TVs under 20000. This is a value for money LED TV from VU. The speakers are average but picture quality is really good. It is one of the most affordable 40 inch LED TV. Similar LED TVs from big brands like LG, Samsung will cost you Rs. 10000 more for the same size. The display panel on this LED TV is of A+ grade and has a resolution of 1920x1080p Full HD. The images appear crystal clear with good levels of details. The contrast, saturation and brigtness levels are really good and provide an immersive experience while watching movies. The dual 20W speaker further enhances the experience by providing great quality sound. VU has provided 2 USB ports and HDMI ports to connect the led television to external devices like pendrives, laptops etc. Overall this LED TV is a really good option because of its large display size, good performance, and excellent pricing. Go for it if you are looking for a 40 inch LED TV under 20000. This is a 40 inch Smart LED TV from Micromax with a Full HD resolution display. This resolution ensures that each pixel of the movie or video or images is displayed perfectly on the screen. This 40 inch LED TV from Micromax has 2 speakers with 12W output each, and the audio quality of the sound is decent but with some distortion at very high volume. The overall performance of this LED is good in this price range of 15000 to 20000. This tv has 3 HDMI and 2 USB ports to connect to the Set-top box, laptop or any other external devices. Since this is a smart tv, you get options like screen mirroring where you can use your smartphone as a TV remote or a controller to play various games on this television. You can also watch online videos by casting the mobile screen to this TV. Apps like Hotstar, Youtube comes preinstalled and you just need to connect the TV to your home WIFI to watch videos and movies. An LG 40 inch LED TV or Samsung 40 inch LED TV with Full HD resolution costs around 10000 higher. 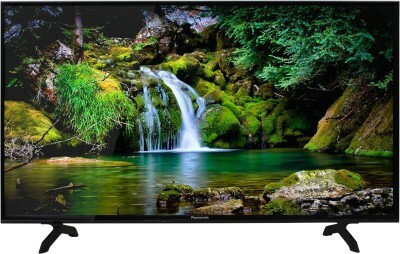 So if you have less budget, then this Micromax 40-inch smart led tv is a good option under Rs. 20000. So this was our list of top 10 best 40 inch LED TVs in India 2019. We hope it was helpful for our users. If you are on a tight budget you can go for non-smart TV. Later if you want to turn your non-smart TV into a smart TV, you can buy Google Chromecast or Amazon Firestick.